9:11 Magazine has brought the Porsche 917 KH Gulf, star of the film “Le Mans” with Steve McQueen, back to life – as an oil painting. For two days, British automotive design student and YouTuber Roman Miah gained exclusive access to the hallowed halls of the Porsche vehicle warehouse to immortalize the racing icon of the 1970s stroke by stroke. Five questions for the artist and Porsche fan. 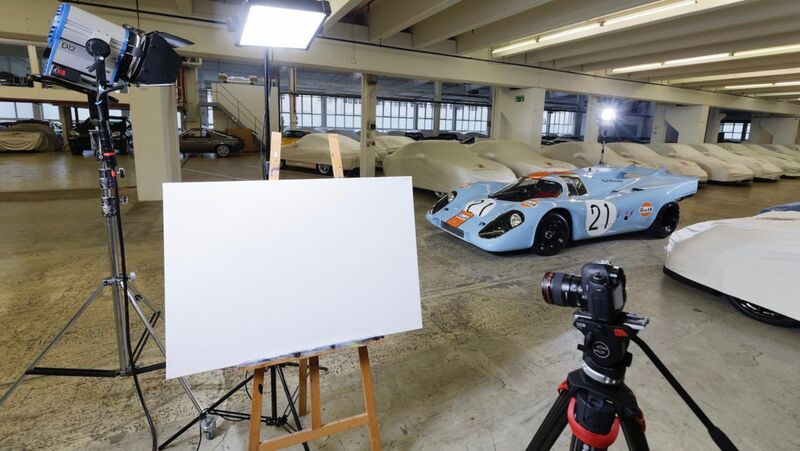 What was the biggest challenge you faced in painting the 917 KH Gulf? It was definitely the oil paints! It had been a long time since I had painted with oil on canvas; overall I’ve concentrated more on drawing. But once there I quickly got used to the materials – it was a great experience! How did it feel to work as an artist in the Porsche vehicle warehouse? The atmosphere was amazing. You’re surrounded by so many new and classic Porsches – it’s a dream come true for any fan. While I was painting, Porsches like the 911 GT3 and the 918 Spyder drove past. That’s extremely exciting, of course. You study automotive design. What fascinates you particularly about the Porsche design? I admire Porsche first and foremost for its engineering acumen, which is unquestionably world class. I love the noble aesthetics of the vehicles – very organic, straightforward and ultra-modern. At the same time I’m fascinated by the more striking, more racing-oriented models in which the designers have succeeded in achieving a perfect balance between beauty and power. Roman Miah admires Porsche first and foremost for its engineering acumen. Where does your fascination for Porsche come from? My enthusiasm for cars in general actually began with the Porsche 911. Over time, I became increasingly interested in learning more and more about them, studying them in detail and talking about them with others. I just really enjoy it. And if I had the means and could choose whatever I wanted, you’d probably find me cruising the streets in a silver 911 GT1 (laughs). It’s an extraordinary and legendary car in my view. What car would you like to paint next? Well, since it just drove by I’d say the 918 Spyder. That’s the ultimate Porsche for me at the moment. I’m also interested in the recently unveiled 911 GT3 RS – the lizard green paint job would definitely look great in a painting. I still have some time, should I stick around ... (laughs)? Leeds-native Roman Miah uses his YouTube channel to share the creation of his hyper-realistic drawings and paintings with other design and car enthusiasts. He studies “Automotive Transport & Design” at Coventry University. In honor of 70 years of Porsche, the current episode 6 of 9:11 Magazine shows exceptional icons of the past seven decades. Chapter 3 is dedicated to the renowned racing star of the 1970s in its blue-and-orange Gulf paint job, the 917 KH, which Roman Miah has set down on a white canvas in oils. The top qualifying time that enabled the first overall victory for Porsche. The Porsche 917 has helped many drivers onto the podium.